The Case-Shiller Index can be distorted by "discounted" home sales (e.g. ; foreclosure, short sale). The Case-Shiller Index publishes on a two-month delay -- data is hardly current. Beyond the above three points, however, the Case-Shiller Index falls short in another area -- it ignores the basic tenet of housing that "all real estate is local". In using 20 cities to represent the entire United States, the Case-Shiller Index reduces more than 3,100 municipalities into a single "market". Even within its 20 tracked cities, the Case-Shiller Index fails short as a housing market barometer. 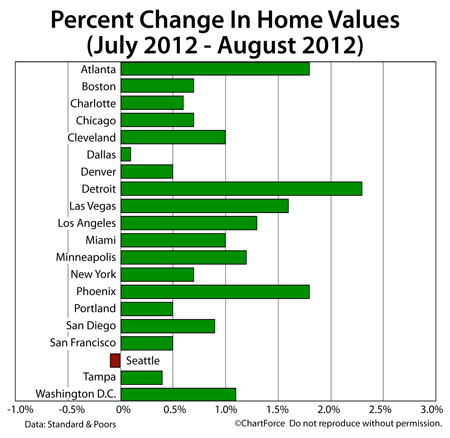 This is because -- even with cities -- home values vary. Some Rockville zip codes perform better than others, for example, as do some streets within Capital Hill. The Case-Shiller Index can't capture markets with that level of detail. National housing data helps in spotting broader trends of growth but provides very little for today's active buyers and sellers of real estate who need "real-time" data. For that, talk to a local real estate agent.